Virginia Beach, VA – January 25, 2017 – Almost every one of us goes through the death of a parent; and often both parents. There’s no instruction manual to tell us how to navigate through those first days, weeks…and months. Growing old is not for the faint of heart. In her debut book, Memories in a Daughter’s Heart, ($14.95, Easter Press, December, 2016) Author Deborah Chapman Newell chronicles the story of her fiercely independent mother’s life. Beginning with the catastrophic event that changed her mother’s entire future, through her later years and struggles with memory loss, to a sudden fatal illness, the author not only shares her mother’s story, but her own story of dealing with the grief and subsequent journey of emotional healing after her mother’s death. Picking up the pieces after laying your parent to rest, and wading through all of the legal and financial decisions that come at you when you’re the most vulnerable. Every daughter grieves differently. No two situations are totally alike, any more than the particular circumstances surrounding each death are alike. This book was written to not only share the author’s message of hope and encouragement during the most trying of personal circumstances, but to also share unique stories of other women who have experienced the loss of their mothers, and how they survived their particular tragedies. Author Deborah Chapman Newell has ministered to many women over the past several years who have lost their mothers, as well as to many others who are in the last stages of their mother’s life. It is her sincere hope that this book can be used as a guide for other daughters and their mothers who are traveling down this same road. 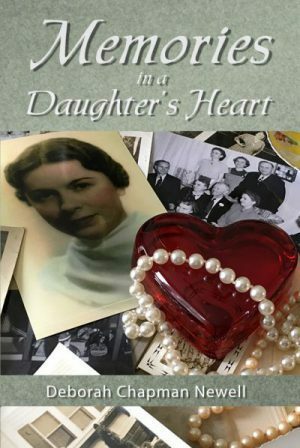 Memories in a Daughter’s Heart ($14.95, 280 pages, 7 X 10, paperback, ISBN 9781539766391) is now available online through Amazon both in paperback and kindle download and Easter Press.